Talk to us for help with your booking. Do you have any enquires? Spring 2019, has come early! Letham House was built for John Buchan, the Laird of Letham, in 1645 and sits on the outskirts of Haddington in 12 acres of very private grounds. 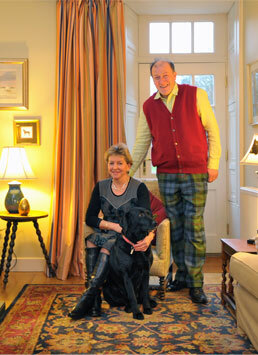 Since moving here in 2007 Chris and Barbara have become a very small part in the history of this beautiful Scottish Mansion House. As you approach down the tree lined drive the house and grounds seem to welcome you. We have guests form not only Scotland and the U.K. but from the 4 corners of the world. You are welcome to relax and enjoy the south facing terrace overlooking the lawns. Beautiful mature trees of Copper Beech, Cherry, Scot’s Pine, Silver Birch and Ash to name a few. Wild life are welcome visitors, lovely families of roe deer, too many rabbits and a wondeful selection of birds come to feed in the grounds and woods. Borrow some wellies and take a walk up the field to visit Charlie our donkey and Hanka our Haflinger Horse. On sunny days during the summer we will serve you breakfast outside on the terrace. Whatever your reason to come to stay we will endeavour to make your time here at Letham House all that you wish it to be.